Godzilla (1964), a web exclusive in Japan, was brought over by Bluefin Distribution as a regular release here in the USA. This release is quite significant as it's the first from the Showa era. It seems that Tamashii Nations is testing the waters, hence the web exclusivity. They have stated that the Heisei and Millennium era monsters are more familiar with today's young adults that grew up through the 80s and 90s, which is the demographic S.H.MonsterArts is currently targeting. That being said, the first Showa release features that era’s most popular incarnation of that Godzilla, known as MosuGoji. This makes it the perfect Showa entry for collectors. 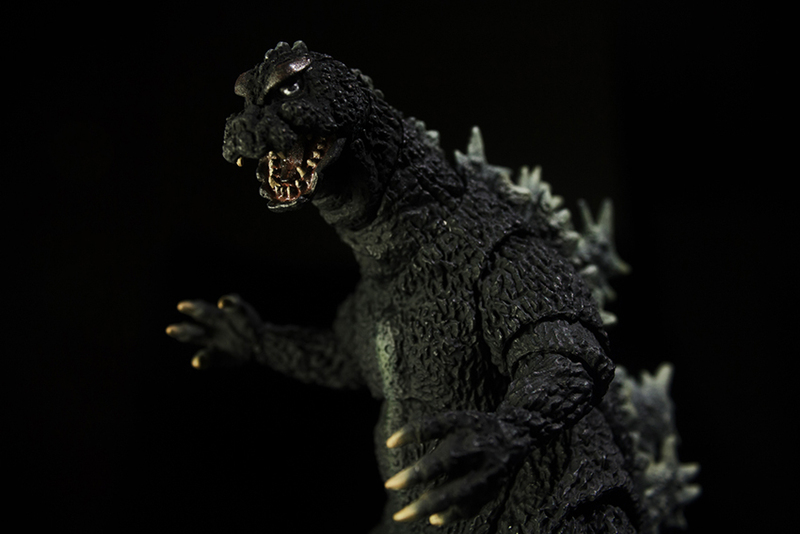 However, does Godzilla (1964) meet collectors’ expectations enough to warrant further Showa releases? 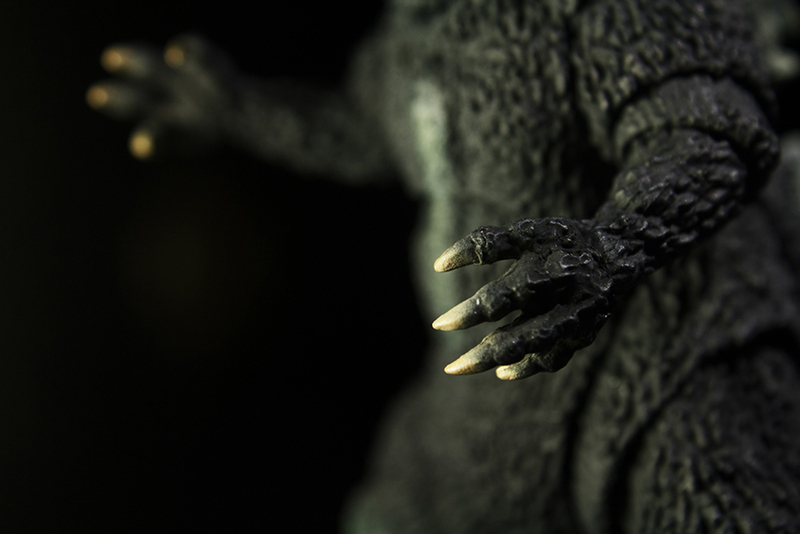 Godzilla is brilliantly sculpted by veteran sculptor Yuki Sakai. 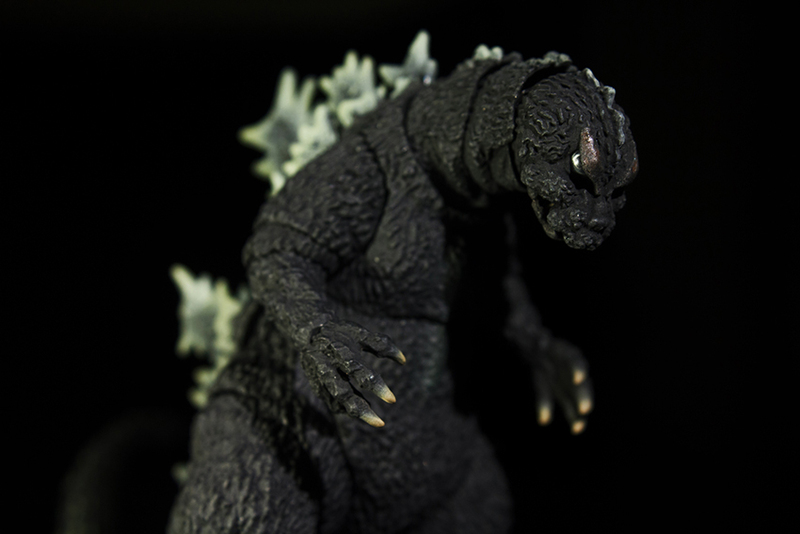 The entire sculpt looks just like the suit used in Mothra vs. Godzilla (1964). The mouth is detailed with each tooth sculpted to perfection, the tongue and roof of the mouth meticulously sculpted, and the gums with just the right amount of space so that when the mouth is closed two fangs are displayed proportionally. The arms, hands, legs, and feet all share the same qualities of expertise and precision. 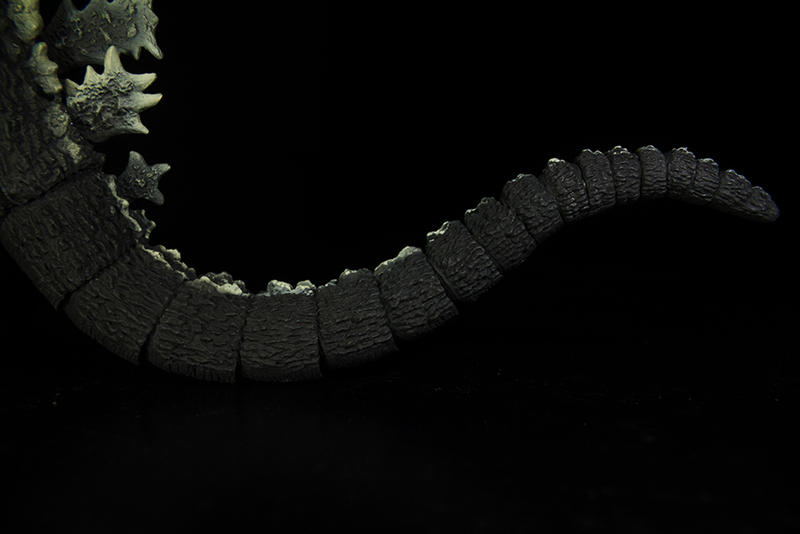 The dorsal spines are fantastic as they feature many bumps and rivets. The sizes of each dorsal spine are in perfect scale with each other. From head to tail, Godzilla’s hide couldn't be better. 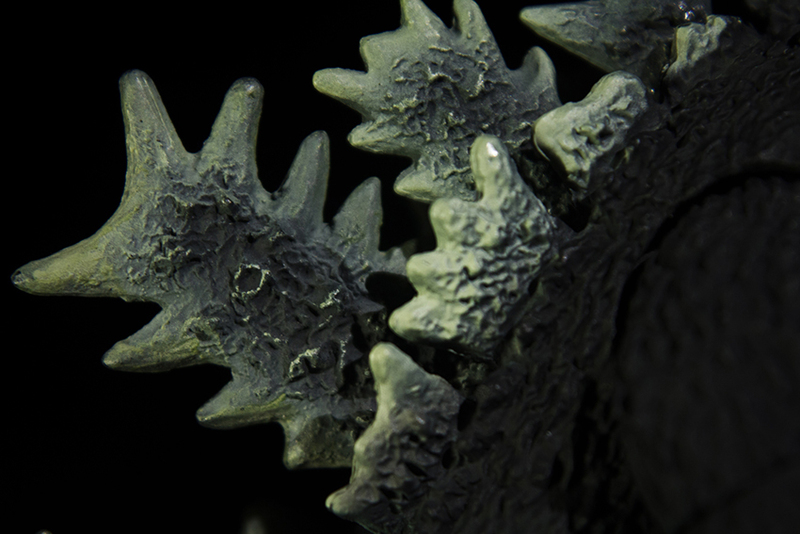 It is layered with bumps, curves, and rivets of different sizes that really add to the authenticity of this sculpt. 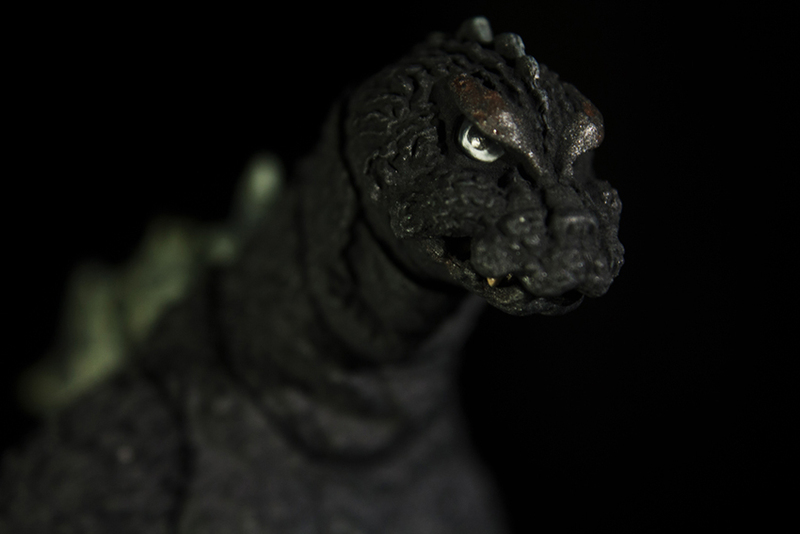 The eyes were designed differently from those of Godzilla (1994). Instead of a painted decal, there is a translucent glass cover over the eyes giving them a slightly more realistic look. 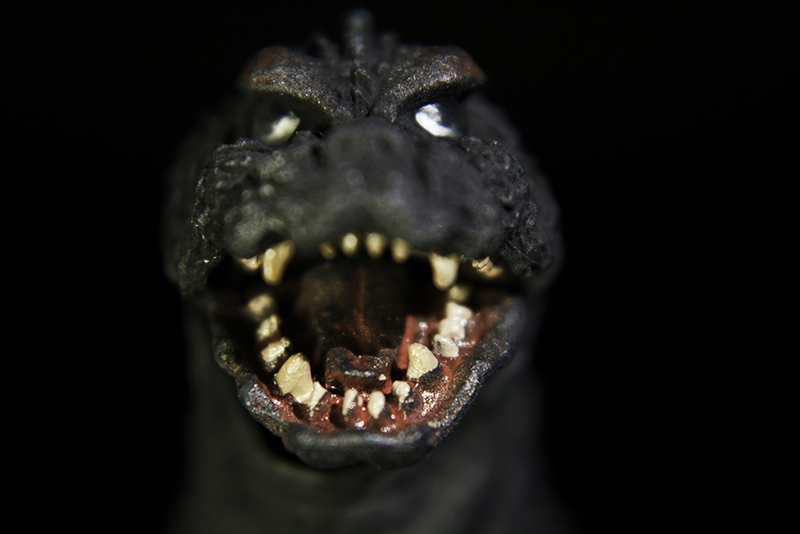 Speaking of the eyes, Sakai managed to capture the signature look from the suit in the movie that made this incarnation of Godzilla look downright menacing. Kudos to you, Sakai! My only issue with the figure's sculpt is that the third largest dorsal spine on the bottom looks like it was assembled incorrectly, creating a gap between it and the next dorsal spine. My figure's torso is able to move back to close this gap, but I've heard others are having a hard time doing so or even can't do it at all. Overall, it is a fantastic design. Godzilla has about the same articulation points as the previous Godzilla incarnations, but with a few increased points and some limiting. The tail is the highlight of this figure. Featuring fifteen points of articulation, the tail is able to smoothly move from left to right, up and down, and curl into that signature "s" shape. Not being very long, the tail is able to hold various poses and doesn't droop. The legs also offer more articulation than past Godzilla incarnations. For example, they are able to form a neutral stance to practically doing splits. The result of this articulation created seams in the sculpt that consumers have dubbed "Triangle Seams," which take away from the beauty of its design. Other than that, the legs can move back and forth and bend at the knees to create different attack stances. 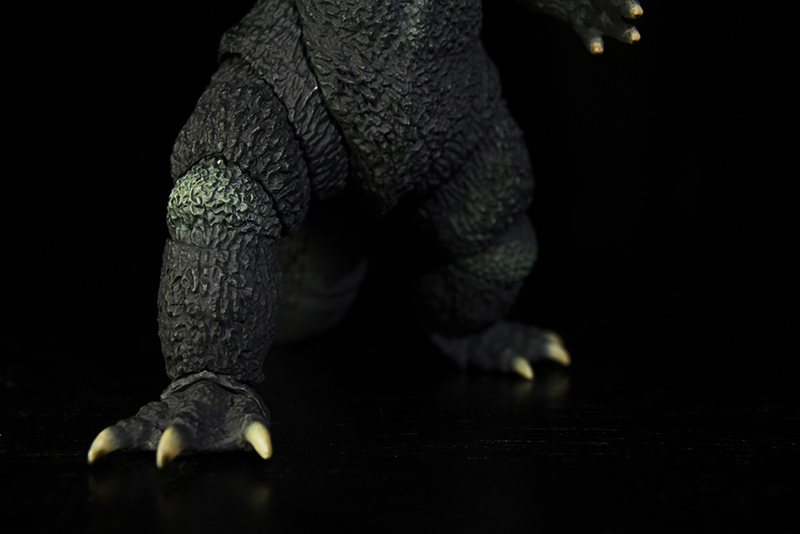 The feet are not flat, but are instead like Mechagodzilla (1993)'s feet, using a joint for a more accurate pose for instances like leaning or halfway stepping off from the ground. The torso is able to move slightly to the left and right. 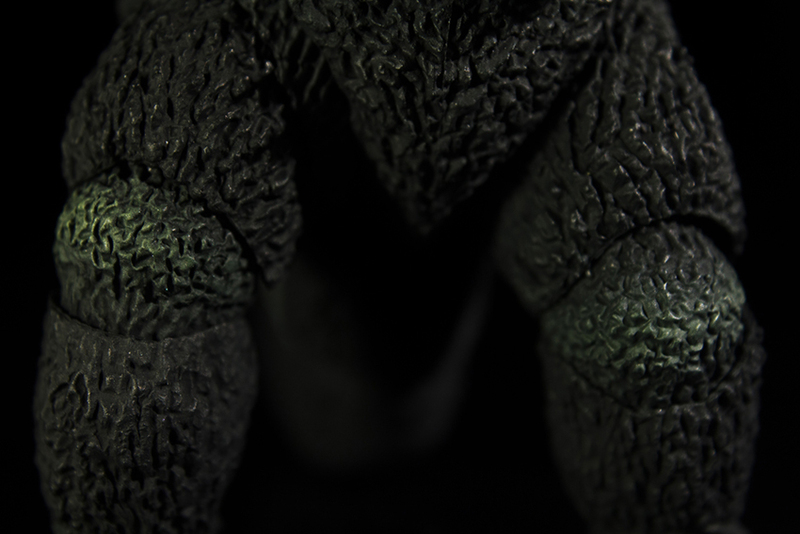 Its main point of articulation is moving back and forth, enabling Godzilla to bend forward quite a bit. This is great for a daunting pose over a cityscape or smaller creature. The only drawback to this is that it makes the already big gap between dorsal spines even larger. The arms are able to move up and down from the shoulder and the elbow bends in the same way. 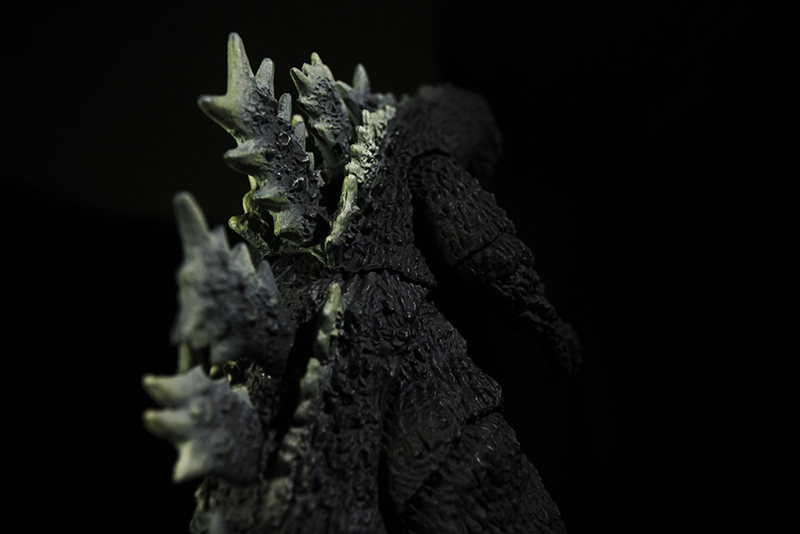 However, unlike past Godzilla incarnations, the shoulders are more limited. Instead, the arms’ full range of motion comes from the elbow where it can be rotated from a neutral pose to embracing a fellow monster for a hug. 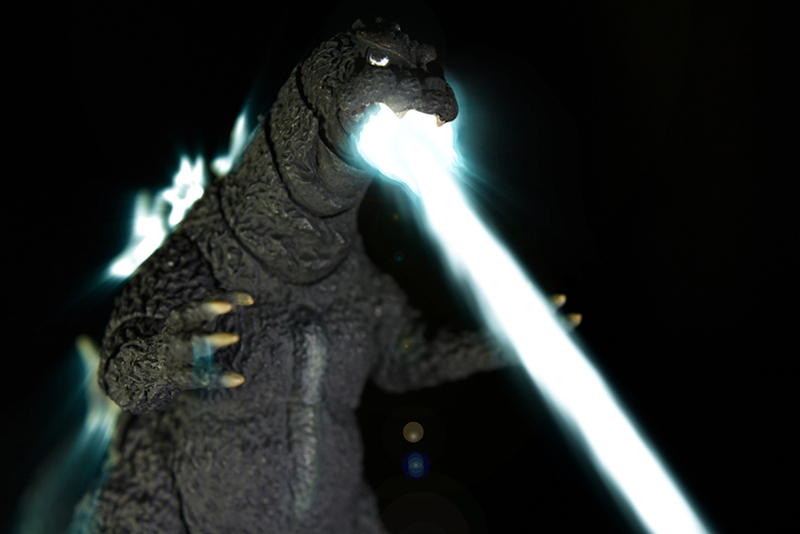 The neck is able to move slightly to the left and right, with a bit more movement for back and forth, enabling Godzilla to look down at the ground. Godzilla's head has similar motion, however it is able to smoothly move in a 360 degree motion. The mouth opens and shuts just as in past releases. Overall, a few elements of articulation definitely sacrifice parts of the sculpt. These sacrifices can be visually avoided if you don’t use extreme posing techniques, but where’s the fun in that? I find that keeping a neutral pose lets this figure shine, though I'm VERY appreciative in the articulation options I'm given for this Godzilla. However, I don't think I'll be making Godzilla do splits anytime soon. The paint job on this figure is amazing. Godzilla has all the right colors and markings. Most of the figure is comprised of a charcoal gray with a few other colors implemented nicely to highlight features. For example, the knees and center of the chest feature a light green-yellowish color. Even though these parts are very small, it definitely adds something special to this figure. The claws and teeth are a perfectly blended yellowish-white color. The mouth features are a dark muddy red color complimenting the charcoal-gray on the body. The dorsal spines are a perfect blend of a yellowish-white to charcoal-gray, with some of the cracks colored white over the darker areas. It easily accentuates the details of the sculpt. The brow features a blend of brown and charcoal-gray. I don't remember the brows colored this way in the movie, but it works well and it isn't lost in the design of the head while adding some ferocity to the face. I'm thoroughly impressed with the paint job. I don't think it could get any better than this. This release of Godzilla does not come with any accessories. Disappointing, yet sadly expected. 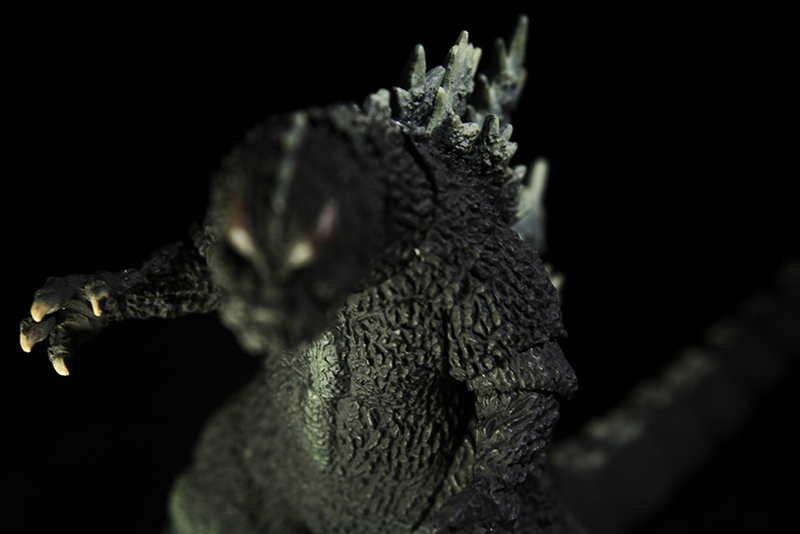 Godzilla (1964) is an excellent figure. It's a great addition to anyone's collection, however, because it is a web exclusive figure, the price point is naturally higher. Since it's the first figure of the Showa era it also doesn't have any other monsters to accompany it in your collection. Some may want to wait on other Showa monsters before picking this one up. The price may go down $10 by then, but you never know. It has very few flaws and none that would lead me not to purchase this figure. 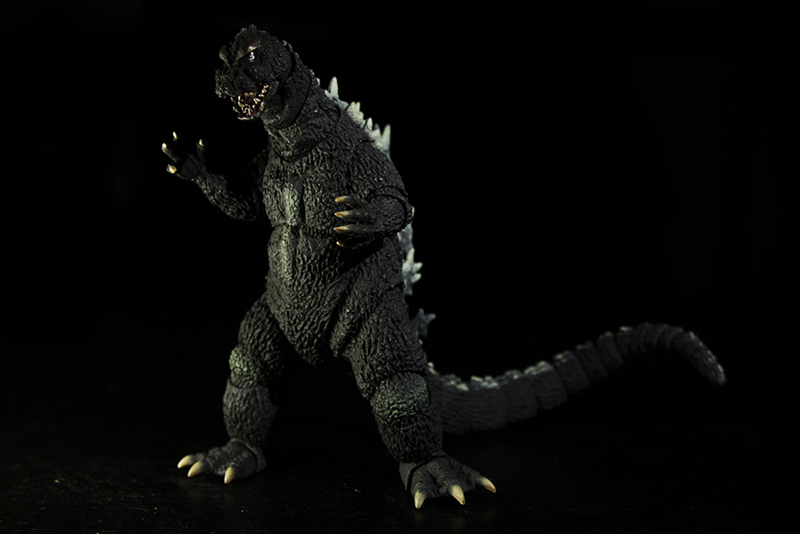 In my eyes, it's the best interpretation of this incarnation of Godzilla an articulated figure can offer. I wasn't at all excited for this figure as it is another Godzilla incarnation and I'm personally seeking other monsters. However, if this figure sells well, it paves the road to future Showa monster releases and that's something I am excited about. Is it a must have? No. Do I recommend Godzilla (1964)? Yes.